Addicted to women and gambling, Leonardo Vinci (c. 1696‑1730) lived fast and loose ‑ dying at the age of only 34 after drinking a cup of hot chocolate apparently poisoned by the vengeful family of one of his young conquests. Unusually for the time, Vinci's operas outlived him ‑ Handel staged several in London ‑ and in 1731 his librettist Pietro Metastasio quipped ‑ 'Poor Vinci! Now he's dead he's finally receiving the recognition for his merits so longed for during his lifetime. See, that's how pitiful man is: fame is the only commodity that can make him happy, but one must first die in order to attain it.' And as for maintaining it, that's a completely different story, and one where Vinci has fared much less well than contemporaries like Handel and Vivaldi. It's really only in the last decade or so that Vinci has began to enjoy proper period‑performance resurrection, and we are only now beginning to enjoy the fruits of serious attempts to stage and record his serious operas in full. I reviewed Antonio Florio's recording of La Partenope in October 2012 (Dynamic), and just a month later there was Diego Fasolis's premiere of Artaserse (Virgin Classics). 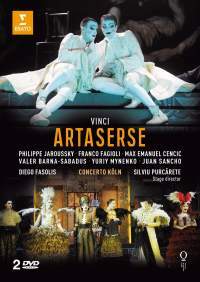 This film of Artaserse, recorded live in November 2012, finally allows us to see Vinci onstage. It has been well worth the wait. Before seeing whether Fasolis's live performance lives up to his studio recording (which I deemed 'Outstanding'), let's quickly recap on the context of Artaserse and its plot. It was Vinci's last completed opera and was staged in Rome in February 1730 just three months before his death. Its initial run was cut short by the death of Pope Benedict XIII but, perhaps because of the public's reaction to Vinci's own death, Artaserse soon shot to fame and achieved international recognition as one of the best‑known Italian operas of the century. Its success rested on the firm foundations of a libretto by the celebrated Pietro Metastasio which offered an unusually straightforward plot, believable motivation and powerful characterization. Metastasio himself referred to it as 'the most fortunate of all my children' because, after Vinci, it was set by at least 90 more composers ‑ extraordinary. Vinci's exceptional cast also played a part in the work's initial success. In Rome women were firmly forbidden to sing onstage, so the original cast was entirely male, boasting some of the best, and best‑looking, castrati of the age, with the famous Carestini in the noble, long‑suffering role of Arbace. The libretto abounds with personal and political conflicts which are used to deepen our understanding of the emotional make‑up of the characters. But the theme , which really drives the plot is simple ‑ injustice. Artabano, prefect of the Royal Guard, kills King Serse, to seize the Persian throne. But his son, Arbace, is the one who is unexpectedly arrested; though horrified by the crime, he remains loyal to his father, who does little to set the injustice right. Semira never doubts Arbace (her brother), but his lover Mandane does. Serse's son Artaserse, who ascends the throne, finds himself in some tricky situations but retains his moral authority. Justice is finally done, Arbace is released, lovers are reunited and, at his son's insistence, Artabano is shown royal mercy. This revival of Artaserse conducted by Fasoli was, rather unusually, spearheaded by one of the singers here ‑ countertenor Max Emanuel Cencic (who takes the female role of Mandane). 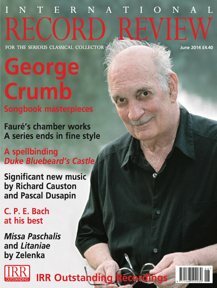 Responsible for casting, he was ideally placed to choose the brightest lights of the countertenor world to re‑create the original all‑male line‑up of the Roman premiere (the only non‑countertenor is the evil Artabano ‑ a tenor). The countertenor cast is identical with the CD release; only the tenor, Daniel Behle, is replaced with Juan Sancho. Without a soprano in sight, the sound‑world should really be much less varied than it is, but the five countertenors are surprisingly well contrasted in timbre and technique. In their female roles Cencic and Valer Barna‑Sabadus may act with womanly grace, but they hold nothing back vocally or emotionally. Cencic, as Mandane, has the audience in the palm of her hand with the slow, introspective intensity of 'Se d'un amor tiranno', but a few moments later, horrified by the villain Artabano, she spits out her recitative and aria 'Va' tra le selve ircane' with less ladylike rage. The wronged but noble Arbace is the character with which we most sympathize, as did Vinci himself, allotting him many of the most memorable arias. Franco Fagioli has an impressive eighteenth‑century 'heroic' voice ‑ effortlessly wide in range, with a masterfully controlled technique and a lavish approach to da capo ornamentation. After his father Artabano's confession of regicide in Act 1, Fagioli and the strings positively tremble with agitation in 'Fra cento affarim'. Virtually at the same tempo as on the CD ‑ Fasolis is fairly consistent in speed between the two recordings ‑ Fagioli still manages to squeeze even more embellishments into the da capo here, to the audience's evident delight. Fagioli really establishes himself as the primo countertenor in his coloratura showstopper 'Vò solcando un mar', which brings Act I to a close. Cast adrift on a cold sea without sails, this aquatic simile aria aptly reflects the rising storm of his heart, and Fagioli brings off the rapid articulation of the 'A' section perfectly, with lots of additions of his own at the end. Live in the theatre Fagioli is more impressive than in the studio, with a little more expressive freedom and dramatic involvement ‑ though the amusing stage business somewhat undercuts the seriousness of the moment. In the title role Philippe Jaroussky is probably the best‑known member of the cast. Vocally, he is more warmly lyrical and expansive than any other member of the cast. In 'Rendimi il caro amico', where he movingly demands 'Give me back my dear friend' (the now imprisoned Arbace), he embellishes the close of the aria's middle section with a meltingly slow and personal cadential approach. The wicked Artabano gets some terrific music ‑ as baddies so often do. Sancho ‑ not as elegantly accomplished as Behle on CD ‑ adapts the music slightly to his more actorly singing style. In 'Non ti son Padre', for instance, he repudiates his son with a strikingly detached lack of feeling, but without hamming it up (his costume, horns and eyebrows do that quite effectively enough already). In his two arias in Act 2 and elsewhere where Sancho rises high in his range, there are a few signs of strain and a slightly pinched tone, though he clearly relishes Fasolis's decision to underscore many of his recitatives with a low‑lying violone (on CD, Artabano is underpinned by a bassoon). The staging is simple, the acting is elegantly restrained (along Baroque lines), but the costumes are unashamedly lavish‑‑, eighteenth century in style topped by some truly magnificent wigs. In contrast, the extras, who help with the props and stage business, are dressed as modern stage hands in black with radio mics, clip boards, and the like. Seeing the opera in the theatre, of course, makes much more sense of the recitatives, which were trimmed a little for the CD release. Here they blossom ‑ not just because the stage business is simple and well tailored to fit them but because it also articulates them, allowing time for the character to absorb the latest development, and change the pace in response. This is nowhere more effective than in the plot‑resolving final scene which manages to keep our attention through six minutes of recitative with no arias at all. With perfectly timed entrances which bring all the main characters to the stage, there's a cumulative build‑up of tension. almost every number. Even from the pit, the conductor draws wonderfully nuanced playing from Concerto Köln, with the brass always loud and chesty, the string articulation clear and precise, and the continuo‑accompanied recitatives supple and propulsive. Both for the music‑making and production this is an outstanding performance which does full justice to one of the great rediscovered operas of the late Baroque.